Langolier wrote: Not sure your number 4 is correct there, i Think a few keepers have broken 10500 in a day. 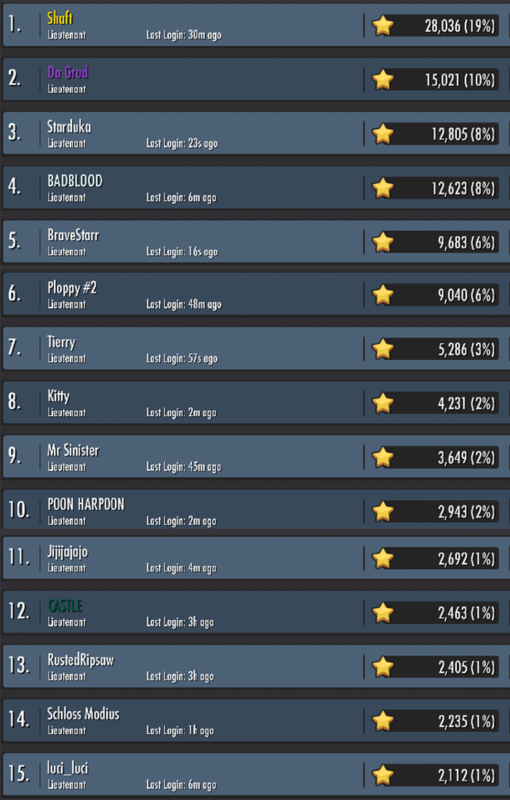 Correct, I myself have done 12k stars in one 24hour day back in tournament 12 (<click here>). Pretty sure even that is not the record tho. I can easily do 10k a day & often do. Tournament update Thread:. There was no update thread or official announcement thread for this tournament. DKDev_Chris wrote: We have identified the source of the problem and are currently working toward a solution. In the meantime, we will be deploying a hotfix that delays the tournament by 48 hours. It took about a day, but EA finally fixed the issue that prevented many from being able to log into the game, they apologized and gave everyone a three day DK Premium boost as reparations for the players inconvenienced. We’re in the process of deploying a hotfix to resolve the issue involving players getting stuck in a perpetual log-in loop. This should also resolve a few other strange behaviors that cropped up with 4.3. We sincerely apologize for the inconvenience—we know your time is valuable, and we appreciate you dedicating it to DK. To compensate you for your lost time, we’re giving all players three free days of DK Premium. From now until December 6th at 4:00 pm EST, DK Premium will be active for all players. Any players who currently have DK Premium active will experience a three-day extension of service. 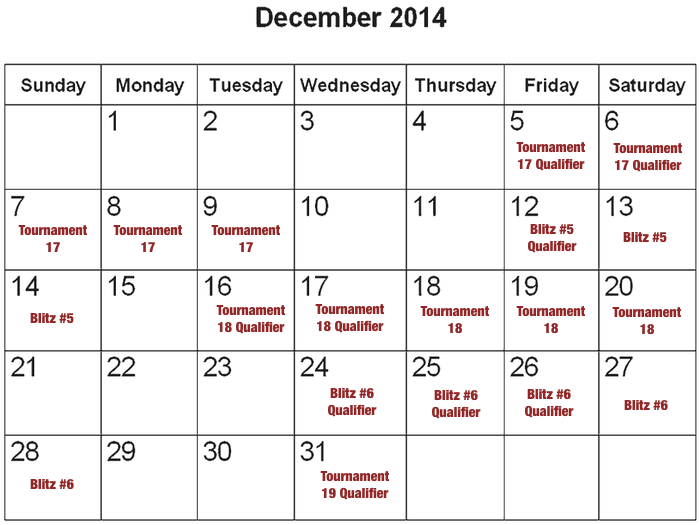 Note - Tournament #17 will remain scheduled to begin on Dec 5th. 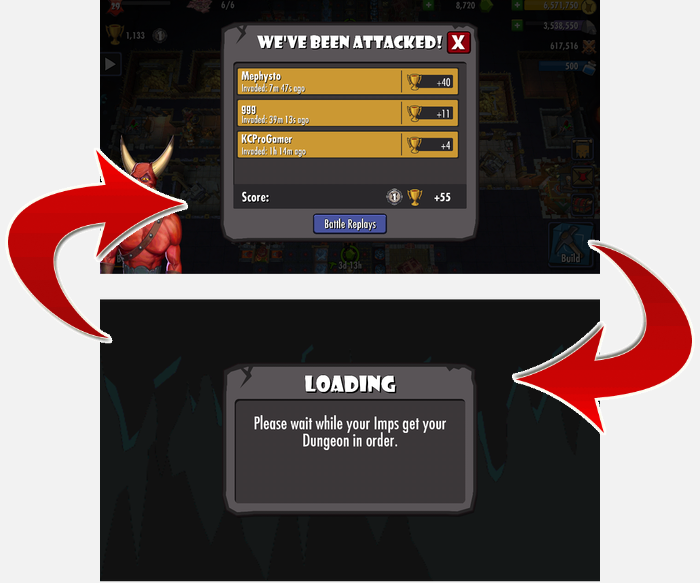 In addition to the "infinite loop" bug tho, update 4.3 was riddled with many more bugs. (<Source Thread>). While these other bugs didn't prevent players from playing many such as the "Immortal not KO'd" bug caused it to be too difficult for them to compete seriously in the upcoming tournament. 680 seats went unfilled in this tournament. One had hoped that after the previous Blitz tournament was filled because the awards were increased that EA might have realized the error of there mistake with update 4.2 and rectified it here, but alas they appear to be a stubborn lot. So yet again we had a tournament with very little motivation to go for first place & when you compound that lack of motivation with the bugs that prevented many from even being able to seriously compete you had a perfect storm for a lack luster tournament. So that is exactly what we got. Even tho Shaft failed in "his" goal, his accomplishment still warrants recognition. Only one other player has ever put up the star totals that Shaft did in a three day tournament, but that other keeper did so with a sandbagged dungeon. Shaft accomplished his total fighting the hardest of the hard dungeons in this game. It truly was a thing of beauty to watch and I applaud Shaft for challenging himself like he did. I myself, had my own little contest in the guild. Vera (aka. GOLDDUST, aka BADBLOOD) challenged me to see who could earn the most stars during the tournament. So in the end, it was a pretty casual tournament for most, Vera is now my "Love Pet" & Skar Tactics finally returned to the top after a long hiatus & won their third ring. Tournament Modifier: 50% increase to Summoning speed, Health, Damage, and Movement speed of Ghosts. Tournament Notes: If I were to try and summarize this Blutz tournament with just one word, that word would have to be "fatigue." 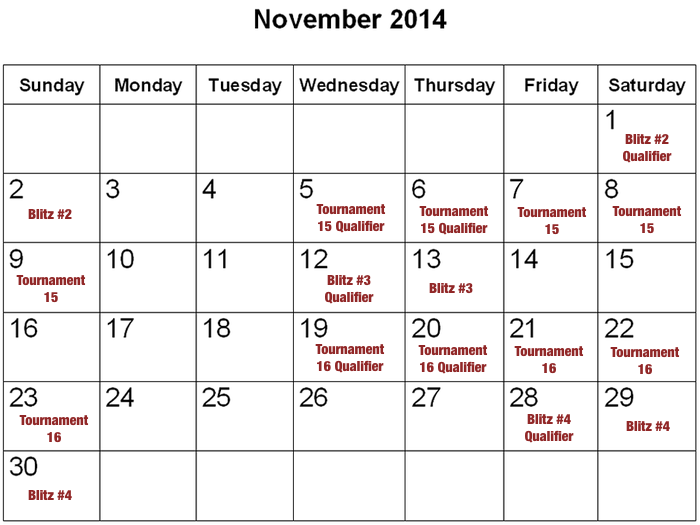 Ever since update 4.2 came out two months earlier (October 27th) there has been a tournament EVERY SINGLE WEEK. In fact, looking at the calendars above you will see that there are actually more days with tournament activities on them than ones without. Doing these updates is really starting to feel like work as every week I must rush to finish each one before the next tournament starts. Odd considering EA itself hosted a poll over 3 months earlier asking everyone how often they wanted to have tournaments and the members of the forum OVERWHELMINGLY spoke up & asked for at least a 10 day break between them. Being that the general public's request seem to once again have been disregarded for some unknown reasoning, we once again (just like tournament 3 & tournament 9) saw a huge outcry for a longer break between events. Bummerrr wrote: blitz tournaments were supposed to be rare. If they happen on a bi weekly basis, regular tournaments need to be spaced out further, to once a month. This is exhausting! Subject: Blitz Tournament #5 / 2days tourney? stark23x wrote: Then let it be known that they are happening far too often now, and we need a break from this. As it's been stated before, DK is an arms race, AND it's hard to get a guild full of people to do or not do a thing. A lot of players hate the idea of "missing out" on a tournament, but another significant number are BURNED. OUT. In the "old days," so many months ago, there was a change to the schedule for just this reason. Players were burned out. Many of us are saying it's time for another change. Maybe slow the frequency of the blitz tournaments down a bit. Dutchie wrote: Please also remind the developers that less is more! A cow only has so much milk, so don't over milk it! Minoc wrote: No one has time for this #$%@. This game feels more like work than fun now. Smellypuppy wrote: ...For a team based event, where people feel they need to help their team by participating the frequency is beyond ridiculous. If these were not team based - fine. One's schedule or decision to participate or not affects only themself and doesn't let down the entire team. 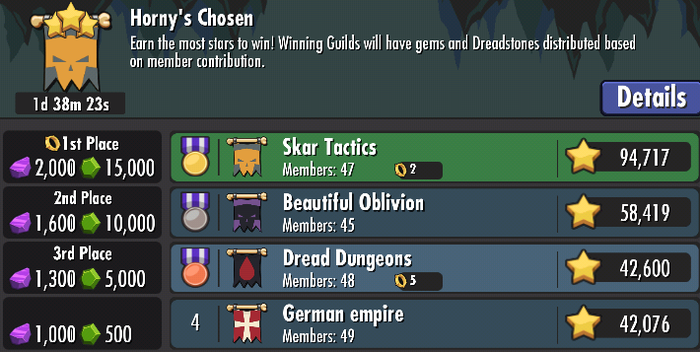 The tournament structure is such that if you choose NOT to participate you often feel like you are letting down your guild. This creates a very tough scenario for many Keepers as they don't wish to let down their game family, but if they participate in all these tournaments than it burns them out or hurts relationships with their "real life" families. KeeperKatrina wrote: I've heard a few rumblings of discontent about the holiday tournament schedule. I’m sure it comes as no surprise that events aren’t thrown up randomly on a given day—these are planned out well in advance. While recent feedback about the pace of tournament and blitz play will be considered for later schedules, it was received too late to have an impact on this one. We have had this same "tournament frequency" issues arise at least two times previously. 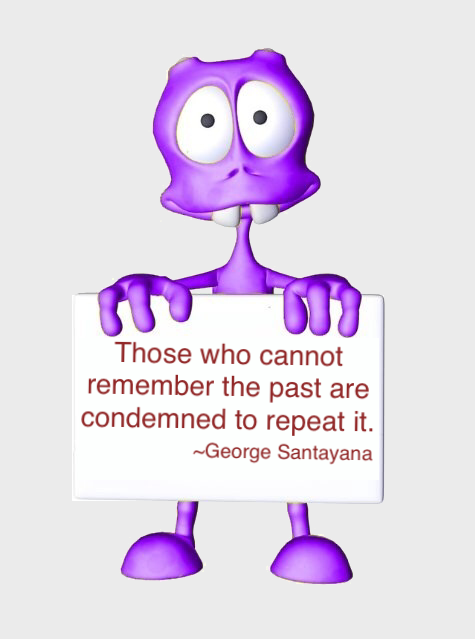 Please look to the past & LEARN from your previous mistakes, EA so you don't keep repeating them!!! Anyhow, let me step down from my soapbox and get back to my post tournament update. This tournament once again did not see all it's brackets filled even tho they reduced the stars needed to qualify to only 500. 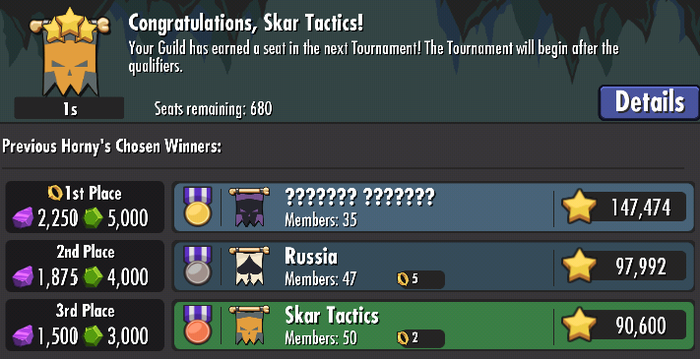 This was most likely due to the tournament fatigue I mentioned at the start of this update as well as the fact that even tho this Blitz tournament was longer than the first three, it's prize was NOT increased. 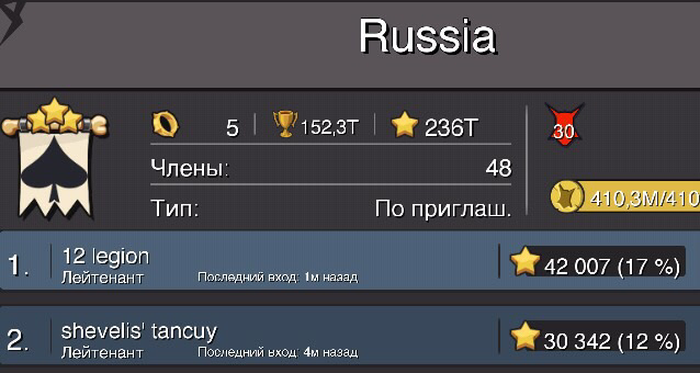 We saw yet another Russian guild win this Blitz tournament & win their first ring. No other guilds seem motivated to even try & compete against them. Most opted instead to all just play casually, use as few gems as possible and just settle for a lower spot. So we have now seen the last 4 of the Blitz tournaments won by Russian guilds. 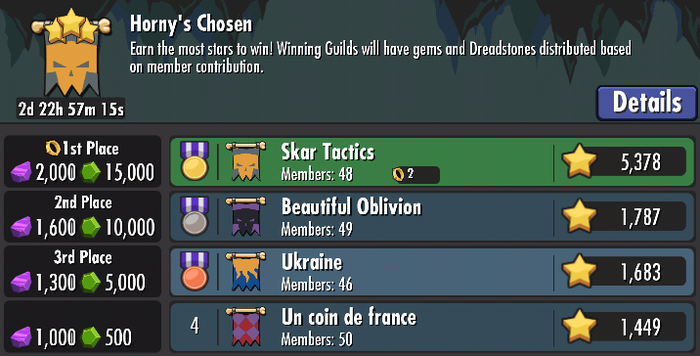 One must wonder if we will continue to see Russian guilds dominate all future Blitz tournaments or will something change that causes another guild to step up & challenge them. If this keeps up, we might need to change the Blitz tournaments name to "Russia's Cup." 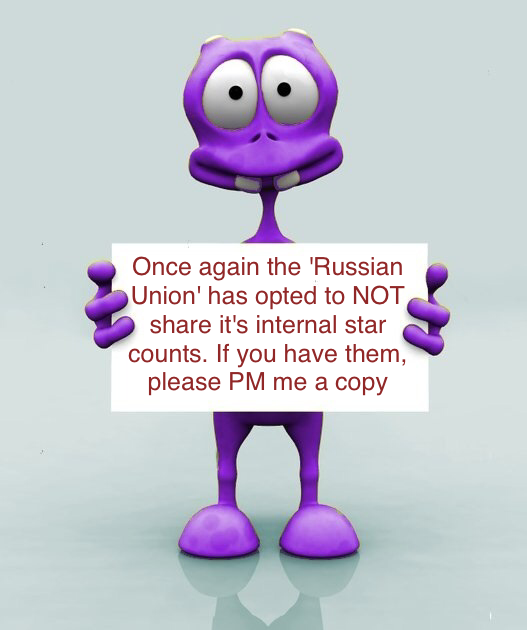 I do not have an internal breakdown of Russian Warcraft's star counts. If you have one, please PM them to me & I will include them here. Last edited by Da Grud on Wed Dec 17, 2014 7:25 am, edited 4 times in total. wow I am happy to get 1200 stars during a tournament.... I dont have the gems/time to go for 12,000 stars. 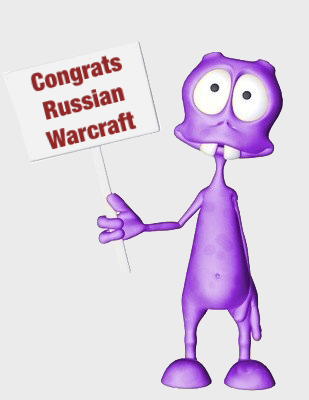 Da Grud wrote: We saw a third guild from the "Russian Union"
Russian Warcraft is part of guild 'Russia'. Oops, I got sloppy with that update. I have corrected it now. Just a reminder if any further corrections are needed, just as the disclaimer states on EVERY SINGLE POST of mine, please "PM" (Private Message) me if you notice any corrections that might need addressing in the future. Tournament update Thread: There is no official announcement or update thread for this tournament. Tournament Notes: While again only half the brackets were filled for this tournament, it was the first tournament since tournament 14 that we actually saw guilds break the 200k mark again. It happened for a couple of reasons; first and foremost we finally had 2 different guilds that both wanted to win the ring & they didn't care about the reduced prize offered by the release of update 4.2. 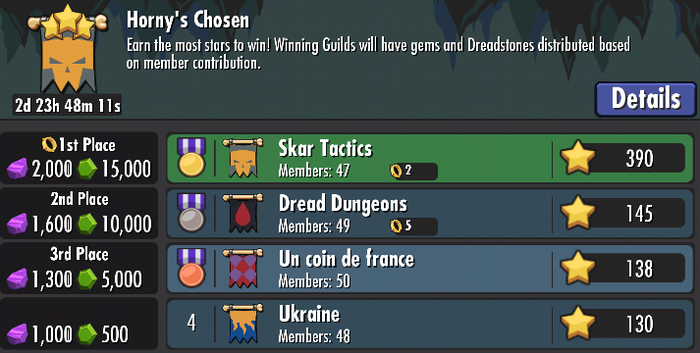 Russia wanted to become the first guild to win 6 rings and many of the top star earners from previous winning guilds like Skar Tactics & Dread Dungeons joined forces this time to win SEWERCIDE it's first ring. ...and this time they never lost first again. 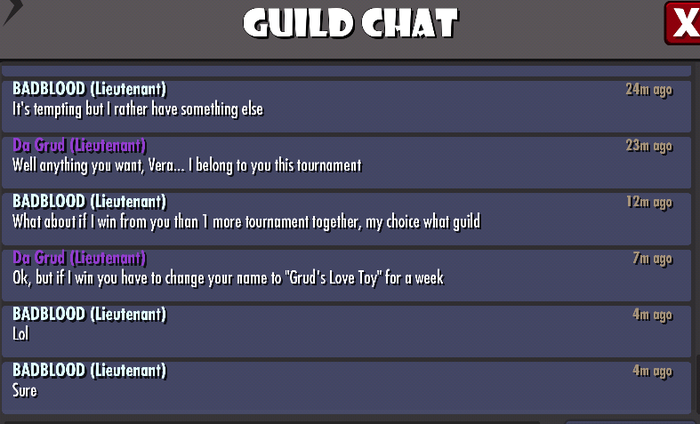 Now I mentioned above that there were a "couple" of reasons this tournament that we finally saw guilds break the 200k star mark again. The first reason was outlined above, but the second reason we saw such high star counts was we had three Keepers that were each attempting to become the new "Star King." Shaft, Legion & shevelis' tancuy each broke the previous record of most stars earned in a single three day tournament (28,281 stars), but ultimately it was Legion who would set the new record with an outstanding total of over 42,000 stars earned in a single tournament. Congrats to all three tho for such an impressive show & for constantly raising the bar of what's possible. Also congrats to Russia for once again proving you are a power guild & for becoming the first guild to win 6 of the elusive Horny's Chosen Champion rings. Other than all the seats being filled tho there wasn't much else surprising about this "Russian Blitz tournament." 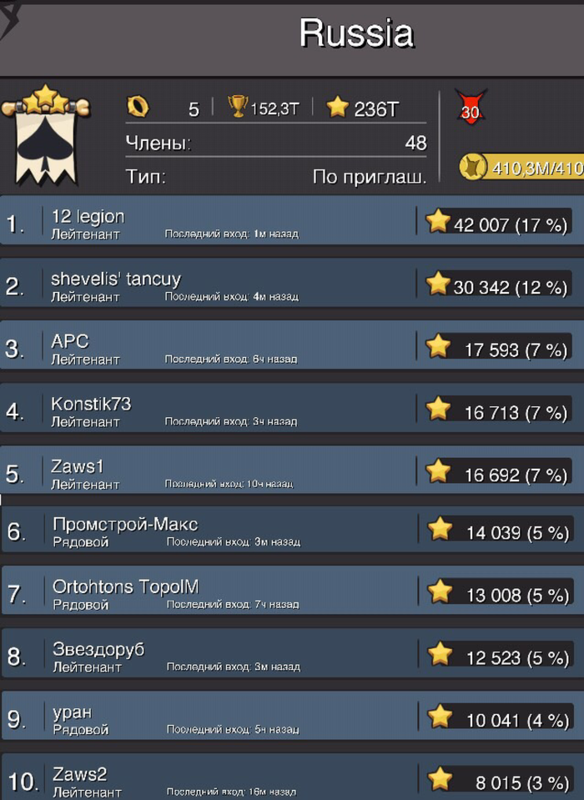 As is the norm now, we once again saw a Russian guild win (unchallenged) yet another Blitz tournament. This time our winner was a member of the "Russian Union" I first told you about in my Blitz #4 update, Русская Лига (Russian League). If you are keeping score, that's 3 wins for the "Union." I wish I had more behind the scenes stories to tell you about this tournament, but unfortunately there just doesn't seem to be any stories here to share. If you have some info you'd like me to add, please PM it to me & I'll be sure to add it. You will notice it has been a couple months since I created an update thread for any tournament. This is because the development team ignored our pleas for a reduction in the frequency of these events and instead has started hosting them more than once a week (on average). This has created a situation that causes waaaaay too many players to sit out each tournament and therefore means that when a guild wins one it is not quite as special as the tournaments of old as they will have faced reduced competition. It is for this reason that I no longer wish to waste anymore of my time researching each tournament and putting together a behind the scences report of each event. Instead I will now just update the original post in this thread with the winning guild's name for each Horny's Chosen Bracket and link you to the results thread so you can see the other guilds that placed in that event. In the event that EA ever reduces the frequency of these tournaments again and I feel they again become a special thing to win I will again start to create individual update post for each event.